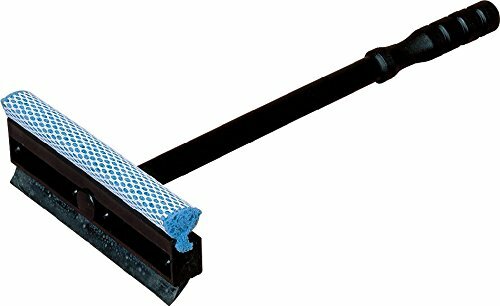 This Carlisle 36286800 black Flo-Pac 8" windshield washer and squeegee has a 14-7/8" plastic handle for strength and resistance to corrosion. The squeegee blade is made of neoprene for flexibility and resistance to tearing. It has an 8" mesh-covered sponge for removing bugs, dirt, and other road debris, and has a molded grip for a non-slip hold.